We watch television a couple times a month, and when we do, it is usually an episode of Globe Trekker on PBS. (We do not get cable, thank goodness, or I may be tempted to obsess over the Food Network.) Last night, I drooled over the scenic scapes of volcanoes in El Salvador, while discovering what it takes for me to receive the unblemished bananas that sit uneaten on my countertop. 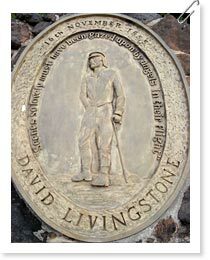 Perhaps our favorite episode was the tour through the travels of David Livingstone in Zambia and Malawi. No matter the country, the culture, or the globe trekker, this show always delivers. Many broadcasts can teach you details and intriguing facts about another culture, but for a program to lure you to live and eat among the locals, and experience the country beyond the sealed and saran-wrapped packaging of tourism...well, that a beguiling piece of television. My husband and I have always wanted to travel the world and discover and share among all the ethnicities the Lord has created. He has spent time in Mexico, Scotland, England, Ecuador, Spain, and Africa. Both of us, married, have traveled to China, Korea, Chile, and India. Two of our kids have seen Mexico, Chile, England, Canada, and India. And now, several years since our last trip abroad as a family, we find ourselves preparing for baby number 4, occupied with the mundane but necessary tasks of life, and sneaking in an episode of Globe Trekker whenever possible. If you've traveled outside the U.S. you know that it changes you--it takes you outside of your egocentricities, and gives you a broader view of living, a truer view of man, and a deeper view of God. My husband and I so desperately want that for our children, as we continue to long for it in our own lives. This is not the season...but, so as to not lose all taste for the way it really is "out there," we whet our appetites with Globe Trekker, and look to the day when our party of six will step foot on land abroad.